Tattoos are a trendy, unique, and creative way to express yourself. Until you wake up one day and realize there’s no way you’re going to living with your ex-boyfriend’s name on your chest for the rest of your life. That’s where the doctors and expert laser technicians at Fox Vein & Laser Experts come in. Offering the very best tattoo removal in Miami, our state-of-art lasers help you say goodbye to your tattoos – for good. With offices in Pembroke Pines and Hollywood, Fox Vein & Laser Experts are the Miami area’s premier location for all of your skincare needs – as we are the experts in vein removal, too! Just a few years back, the thought of laser tattoo removal might have instantly made you squirm, because way back when, this type of tattoo removal procedure was painful! Not to dwell in the past, but at one time, tattoo removal was even difficult for people with darker skin tones, or more colorful tattoos. But just like anything else, time changes things – and it also helps to have one of the best lasers on the skincare market available to you in our offices. With the PicoWay laser, the gold-standard in tattoo-removal, you’ll be able to kiss those tattooed mistakes buh-bye in no time. Well, first it’s important to understand what a tattoo really is and how it’s made permanent on your skin. Tattoo style are essentially just several different pigments of color injected deep enough into the skin so that they can’t wash off or disappear over time. Tattoos used to be done manually — that is, the tattoo artist would puncture the skin with a needle and inject the ink by hand. Though this process is still used in some parts of the world, professional tattoo artists use tattoo machines. A tattoo machine powers the needles up and down as ink is deposited in the skin. What exactly is the PicoWay Laser? Why is the PicoWay laser touted as the best in tattoo removal? Because of the three wavelengths, it’s like getting thrice the tattoo-removal action at once. With three wavelengths in one system, the laser technicians at Fox Vein & Laser Experts are able to treat the widest range of tattoos –most tattoo colors & types, including recalcitrant tattoos and blue-green pigments. How many tattoo removal sessions will I need to remove my tattoo for good at Fox Vein & Laser Experts? The number of sessions you’ll need to remove your tattoo at Fox Vein & Laser Experts depends on several things: your skin type, the age, the size and the color of your tattoo. Newer and larger tattoos with more color will obviously take longer to remove, as will tattoos on darker skin tones. The average can range from 2-3 sessions to 4-6 sessions for larger tattoos, but often not more than that. The PicoWay laser tattoo removal treatment is safe for all skin types. The 1064 nm wavelength produced by the PicoWay laser has been carefully selected to utilize the difference in absorption for the treatment of tattoo pigments no matter your skin tone of type. Treatment of tattoos can therefore be performed with minimal adverse effects on normal skin structures. Will tattoo removal with the PicoWay laser hurt? If you’ve ever had laser hair removal, you can expect laser tattoo removal to feel similar. With a little bit of numbing cream, the laser tattoo removal process at Fox Vein & Laser Experts shouldn’t hurt one bit. Laser skincare typically has the feeling of tiny rubber bands flicking your skin at once. Some may consider this uncomfortable or a bit ticklish, more than they do painful. Because the patient is in a medical office having the tattoo removal, if they experience pain, the nurse or physician can use numbing cream or injections to remove any discomfort. Will tattoo removal with the PicoWay laser leave marks on my skin once the tattoo is removed? Thankfully, just as soon as your tattoo is removed, there will be no long-term effects on your skin. While you may experience a little redness in the days following your laser tattoo removal procedure, you won’t see anything else after that. The point of the PicoWay laser is to remove your tattoo and leave your skin looking just as smooth and clear as it did before you treated it to some ink. Picoway has minimal risk of hypo- or hyper-pigmentation with tattoo removal. How should I care for my skin after the tattoo removal process? Once considered an extremely painful and time-consuming process, laser tattoo removal has come a long way in a short time. Not that we’re trying to convince you to lose the tribal arm band that you were inspired to ink onto your body in the mid-90’s, but we’re just saying – at least you have the option. 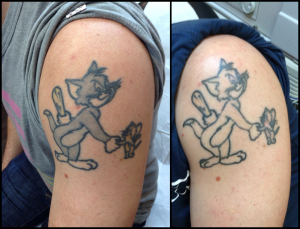 At Fox Vein & Laser Experts, a leading Miami tattoo removal center, your clear, tattoo-free skin awaits you! Call today for your tattoo removal consultation.